So, this post started it’s life 9 days ago, where it had the title – “Recharge and Relax”. 9 days later, and on the second to last day of the school holidays and I am finally able to have time and space to write and boy, has a lot changed. But, that’s just how the cookie crumbles, isn’t it? We have well-intentioned plans and expectations and then things get in the way. We get hijacked! I had an extensive “Holiday To-Do” list. I was going to be superwoman and tick off everything from my list. The reality was a bit different to the dream. One thing has struck me though about my list – and it must be noted that the list was written straight out of my thoughts and wasn’t rearranged or put in any particular order – was how my priorities naturally fell: work first, then family and then finally me and sleep. I find it very difficult putting myself first. But I need to. I need to find time to recharge and relax and rest. The quote below is one that often does the rounds on social media – and it is a timely reminder. 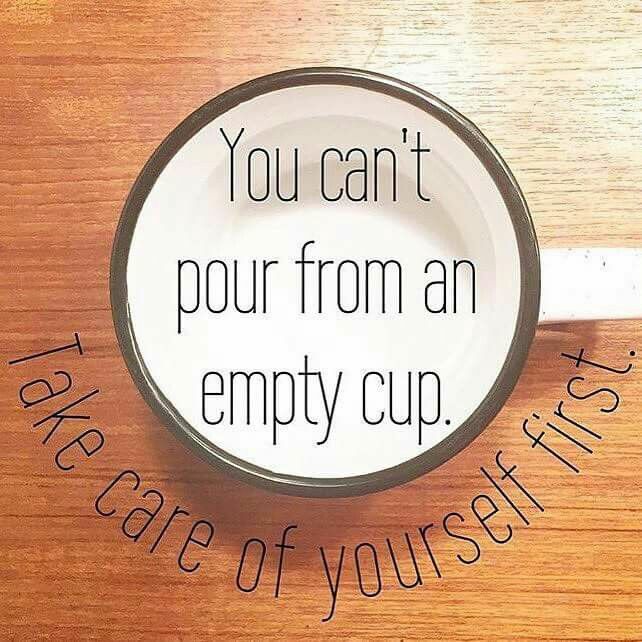 And it isn’t just about having enough in your ‘cup’ to look after and give to others, it is also about recharging so you have the energy to do the things YOU want to do – whether that be reading a book, painting a picture, learning an instrument, making, creating, looking after yourself. These holidays I have struggled to find time to create and write. I have wanted to and the words having been buzzing around my head but it has been difficult having the time and energy to do it. SO, I am very glad that with only 2 days left till school goes back, I have been given some reprieve from ‘mummy duties’. And what was the first thing I did? Ironing! You got it! Ironing! (But, at least I didn’t have to watch ABC for Kids while doing it. I laughed and shed a tear as I ironed watching “La-La Land”). Now with the ironing out of the way, I am going to be selfish and am going to put myself at the top of the To-Do list. I’m not sure how long this priority will last, but at least it’s a start. Why does the reality always fall short of our ideal. Just too much to get done? I am reminded of Alain de Botton in Consolations of Philosophy- if we aim lower and achieve more are we actually happier with the result? I don’t think we should lower our expectations but maybe we need to make 2 lists: a realistic To-Do list and a Wish To-Do list. The wish list could contain things that you want to do but don’t have a timeline or deadline- they’re just on the list because we all like making lists and need help remembering the things we want to do. This was on my FB feed today and seemed worthy of weaving into this thread! Hahaha! That is oh so true!